Horror is my absolute favorite fiction genre, and October is my excuse, or very good reason, to pull most of our scary books for a display. Not that we have to really promote scary books; we have a horde of middle-school ghouls constantly asking for scary books, and we can barely keep up with the demand. Maybe it’s an effort to feel more grown up or assert some control, but many of our students seem to gravitate toward the horror genre. Growing a middle-school horror collection has been popular with students, but we’ve had to work on defining the parameters of the collection and really get to know some of our readers. To help with this aspect we created a Scary Scale ranging from 1 skull being least scary to 5 skulls being the most scary. 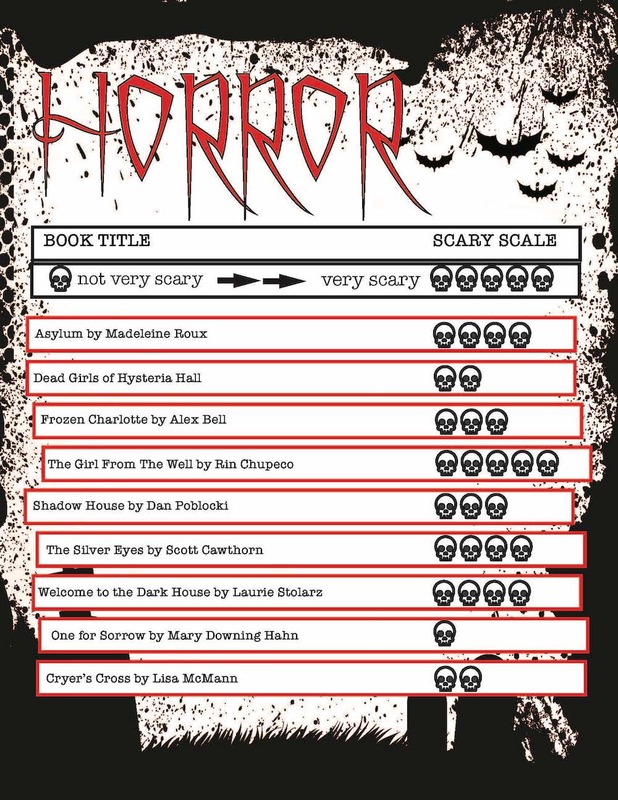 We’ve also created several sub-genre booklists like SciFi Horror, Zombie Horror, and Historical Horror to help students find the right types of scary books within their scary level comfort zones. Partially due to the film release of Stephen King’s It, Contemporary Horror is what our students consistently request. After explaining that buying It for our library is highly unlikely, students want to know if we have anything like It. Buying contemporary horror can be a little tricky. Our two biggest factors are sexual content and violence. Most of the time when we pass on a horror book it’s due to sexual content we deem too mature for our middle-school library. If that’s not an issue, we assess the level of gore and violence in relation to the Horror genre and our readers. The Shadow House Series by Dan Poblocki gets 3 skulls on our Scary Scale. Enough of a scare factor to be horror and not feel too childish for a 6th grader to enjoy. Undead and Unfed by Kirsty McKay also gets 3 skulls for being solid zombie stories with a reasonable amount of zombie gore, suspense, and a little mystery. The Red Eye Series gets 4 skulls as surprisingly scary stories ranging from serial killers to ghost dolls. The Five Nights at Freddy’s series gets 4 skulls for a plot involving child abduction, a serial killer, and maniacal ghost animatronics. Students who are already fans of the FNAF video games and franchise will love this series. The Asylum Series by Madeleine Roux gets 4 skulls and includes murdery ghosts in an old asylum, a carnival, and New Orleans. Girl from the Well Series by Rin Chupeco is our only 5 skull rating right now. The first book is pretty violent while book 2, The Suffering, is a better scary story in my opinion. Focusing on the Horror genre has been especially fun for me as a horror fan, but also as a school librarian. I’ve had more reading-related conversations with students and students have been giving us very useful feedback on our selections. What are some popular scary books in other libraries? We’re always on the lookout for scary book suggestions.